When you think about simple little questions like which color of the rainbow you most enjoy, it's not all that common that you're actually answering a question about which cosmic power you wish to gain control over. But, here we are! So, believe it or not, your choice of red means that you enjoy rewriting all of reality to suit your wants. Blue probably means you like travel a lot. Yellow makes you rather imaginative while green says you just need a few extra minutes on your nap. Watch out for those orange and purple folks. Power over the spirit and energy of creation itself is scary! Of course, if your answer was the whole danged rainbow, then you might just have what it takes to make a real impact on things! 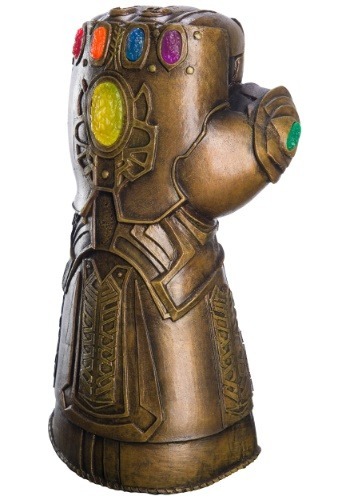 See how your kiddo can manage the power of all of the cosmos with this Child Infinity Gauntlet. The latex glove doesn't actually possess any real cosmic power, but the bronze texture and faux gems will make it seem true! Ever look at your kid and wonder what they'd do with unlimited cosmic power? Well, before helping them rush out to gather all the Infinity Stones, you can see their reaction upon letting them slip on this Infinity War Child Infinity Gauntlet and see if their reaction is one of mature reason or giggling glee. Either way, we know you'll all have a ton of fun!